This was released on the web. 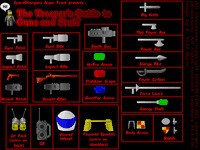 Plasic brick wargame genre in 1991 with Lego Wars and reinvented the game in the 1995 sequel, Lego Wars II. The two of them went into hiding following legal persecution by the Lego Group, who questioned the appropriateness of their unauthorized use of the trademarked word LEGO®.So they changed it to be called BrickWars.